Sometimes in my practice it feels like the more I learn the less I know. 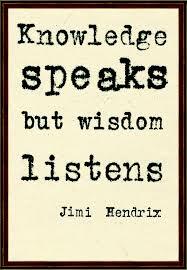 Sometimes all the knowledge I have accumulated is nothing compared to the power of simply listening. Being present for another person is one of the greatest gifts we can offer. Sitting and listening while someone shares their life experience provides a valuable gift to the person being listened to, and at the same time provides you with the gift of wisdom and learning. Such is the case with so many of my patients, including Leigh-Ann, who has been coming into the clinic several times a week now since commencing her cancer treatment.